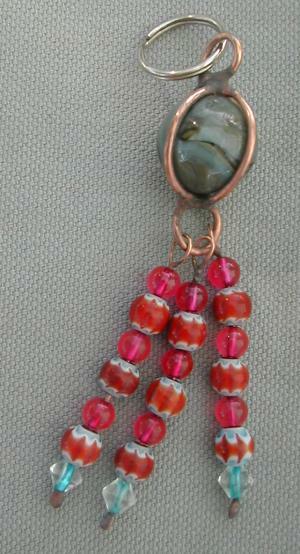 Keyrings are made from a large glass marble, copper wire, and glass beads. Each has a key ring attached to the top. They can be ordered in any color combination. They make great gifts for the home or office. Keyrings are $6.50 + shipping/handling ranges from $3 to $5. Several can be shipped together for lower shipping costs.